You can extend the life of your email newsletters with our easy-to-use and free ARCHIVE feature. Here's how it works. Under the Emails tab, select Archive at the far right. Select which newsletters you want to include in your archive by clicking on the Page icon under the Tools column. 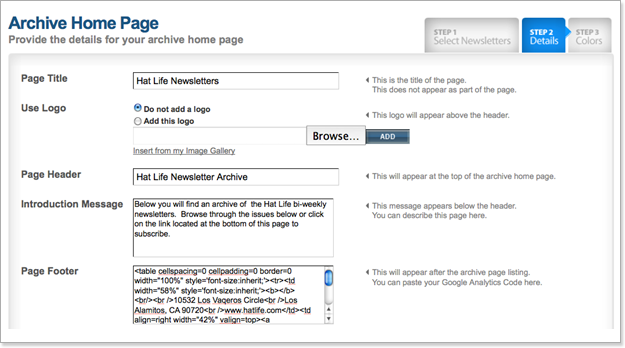 Next, you can create a header and introduction for your Archive Home page and add your logo. You can set fonts and colors and add a sign up box for new subscribers. The last step, which is optional, allows you to create a "View our Archive" button to place on your website or in your newsletters. The Archive feature is a great way to share your past newsletters with new subscribers. And it can be done with just a few clicks. No technical expertise is needed. And best of all, it’s a free feature which is already included in your Benchmark Email account.